Travelling across Australia, spending the Winter in Spain or house sitting in the Cotswolds, my parents are always planning their next adventure. They are making the most of an active retirement and are often told they could pass for a decade younger. As well as good genes, my Mum puts it down to a healthy lifestyle which included giving up meat 15 years go . We didn’t eat much red meat before that anyway as she was put off by the mad cow disease days of the 90s. So when Quorn got in touch asking if I would write about their range, I knew just the person to ask for advice. My mum has been using their products, especially the mince, since I was a child and with 85% less saturated fat than lean beef and zero cholesterol it’s a good alternative for us meat eaters as well. Always use a good stock as the mince absorbs the flavour really well. You don’t need to fry it and can add it straight to sauces. A dash of Worcestershire sauce will help add depth of flavour. Mix in finely diced vegetables like peppers to add texture. Serve it to meat eaters and I bet they won’t know! Fry the onion for 5 minutes until softened. Stir in the Quorn mince and then the tomatoes, herbs, stock cube and Worcestershire sauce. Simmer for 5 minutes. In another saucepan melt the dairy free butter butter and stir in the flour. Slowly add the dairy free milk and stir constantly until thickened. Add the dairy free cheese. Layer the mince, lasagne sheets and cheese sauce in an ovenproof dish, finishing with a layer of cheese sauce. Bake at 200c for 30 minutes until golden. This looks delicious! I love lasagna. My husband never wants to try veggie meals as he is a true canivore. I wonder if he would even notice if I substituted the mince? 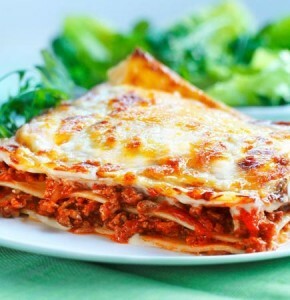 I’ll have to give quorn lasagne a try I think its a great idea to use quorn in replacement of beef or lamb mince. It sounds yummy. I’ve only used Quorn a handful of times and those tips are fab and will definitely be used next time I use Quorn to hopefully make it taste even better.